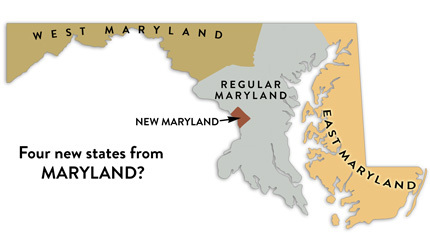 4 new states from Maryland? Just looking at map of Maryland makes it clear it's one of the most poorly-designed states—with ungainly tentacles spreading in all directions. The result has been a long list of proposals to carve out new states: Folks on the eastern side of Chesapeake bay have regularly clamored for separation. Washington DC (which is not actually part of Maryland, of course) also wants statehood. Now, western Maryland is getting into the act. “Western Maryland: A New State Initiative,” has been launched by a guy named Scott Strzelczyk. My map above overlays Strzelczyk's proposed state on top of the other statehood proposals in the region. 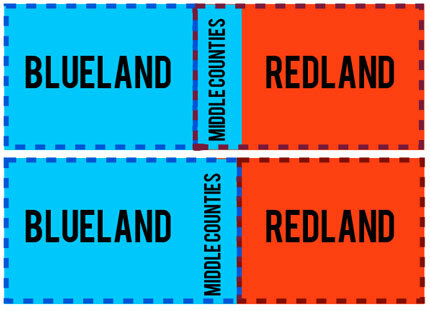 Let's say you have two states that border each other, Blueland and Redland. Blueland tends to vote 51 percent for the Blue Party, and Redland votes 51 percent for the Red Party. Those margins are too close for the majority leaders in each state--who sweat out each election. Now, let's say the overwhelming majority of the voters in the Middle Counties vote for the Blue Party. They are sick of being governed by the Red Party so they petition to secede from Redland and join Blueland. This is actually good for Red Party leaders in Redland, because—despite becoming a slightly smaller state--they could now be assured of Red victories going forward. Because if the Middle Counties secede from Redland, then Redland has a higher percentage of Red voters. Blue Party leaders in Blueland get the same desirable outcome, that is, a higher percentage of Blue Party voters in their state. And Middle County voters get what they want; governance by the Blue Party. The only people who don't win in this scenario are the minority parties in each state who lose clout. They might not like it, but because they are minorities, they can be outvoted. So if Scott Strzelczyk really wants to make changes to the governance in his region, he might look to join neighboring Pennsylvania, West Virginia, or Virginia. It's still a long, long, long shot... but it seems more feasible than creating a 51st state. 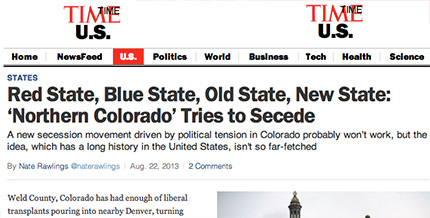 5 Tips for "North Colorado"
I talked with Time magazine yesterday about the statehood plan brewing in northern Colorado. Nate Rawlings wrote a nice piece which includes a couple quotes from me and a mention of Lost States. Thanks Nate! You can read it here. A number of counties in northeastern Colorado are talking about creating a new state—and it's more than just talk, as ballot measures and votes are happening in several counties. Does this movement have any hope? The answer may surprise you. First, if the question is, "Will the movement get results for its backers?" then the answer is almost certainly "yes." Every time a movement like this gets going, it stems from some perceived inequity. Typically people in outlying areas feel like the central government isn't responsive. So they threaten secession, which attracts enough attention to get some concessions from officials in the more populated areas. In the case of Colorado, the end result of this might be some compromise on fracking laws which have been divisive. Now, if the movement truly wants to create a new state, they have some work to do. First, the counties of northeastern Colorado don't have nearly the population they'd need to start a new state. So I'd suggest they expand their reach and try and join with other statehood movements in the region. Western Kansas pushed for statehood in the 1990s; residents of eastern Wyoming and western South Dakota have long pressed for a state called Absaroka; and several movements have attempted to split off the Texas and Oklahoma panhandles to form the state of Texlahoma. Melding all these together creates a legitimate-sized state. 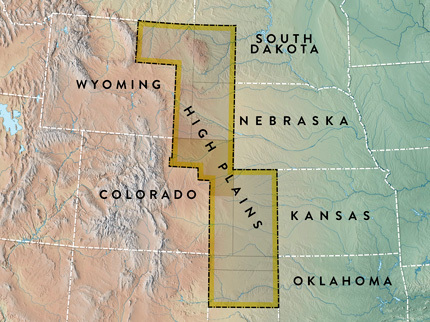 I'd call it High Plains, but that's open for debate. Maybe "Lincoln" would be better. I give credit to Weld County Commissioner Sean Conway who seems to understand that, practically speaking, states have to enter the Union in pairs (One leaning Democrat, one Republican). Puerto Rico wants statehood, and would be the perfect match for High Plains. While High Plains would be among the reddest of red states, Democrats are realizing this might not be such a bad idea. New Republic magazine notes that removing red counties from Colorado would make the state more blue overall—important in that tipping-point state.